Let the name calling commence. 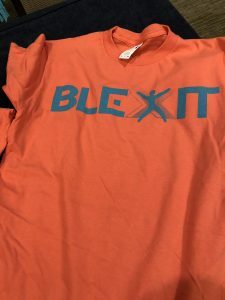 Kanye West has designed T-shirts encouraging black people to exit — or “Blexit” – the Democratic Party. West’s designs debuted Saturday at Turning Point USA’s Young Black Leadership Summit, a meeting of young black conservatives in Washington. West didn’t attend the conference, but was there “in spirit,” according to TPUSA’s Communications Director Candace Owens. “Blexit is a renaissance and I am blessed to say that this logo, these colors, were created by my dear friend and fellow superhero Kanye West,” said Owens, 29. Owens said there will be a Blexit tour to major cities including Chicago and Philadelphia, starting next year.